In the town known all over the world for its ceramic tradition rooted in the far Middle Age, for 25 years, the month of June has been the month of the International Ceramic Festival, an unmissable opportunity to learn about this extraordinary local production, participate in laboratories, buy unique pieces from local craftsmen and live the atmosphere that animates the town during these days. The linking thread chosen for this edition will be “Renaissances. Stories of Lands, Territories and Talents“: the word Renaissance in the plural form means many ideas to reinterpret stories and knowledge of the past and to shape the future into an age of historical change. This theme relates primarily to the collaboration with artists such as Hidetoshi Nagasawa, who designed an impressive sculpture for the city, and Thomas Lange, whose works are exhibited at Palazzo Podestarile, as well as city installations, laboratories, demonstrations, meetings and finally the exhibition market with over 30 exhibitors. On the occasion, the basements of the historic center of Montelupo Fiorentino will become ateliers where local ceramic artists from all over Italy will create a true village of art where to discover or rediscover the secrets of a truly exceptional manufacture. 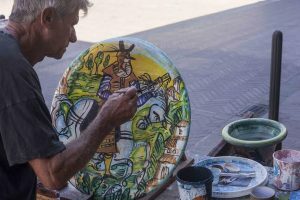 In June, the event, now famous, welcomes visitors from Italy and abroad by offering them an experience of direct discovery and experimentation of ceramic manufacturing.